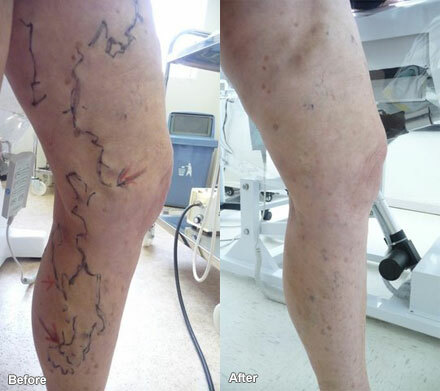 Patients seeking relief from varicose veins without surgery should consider the Endo Laser Vein System, or ELVeS. Varicose veins are a very common condition in the Australia and affect approximately 15 percent of men and approximately 25 percent of women. Varicose veins are the blue or purplish enlarged veins you typically see bulging out of one’s leg. The word “varicose” is derived from the Latin root word “varix,” which is translated in English as “twisted.” Any vein in your body may become varicose, however, its important to note that this condition or varicose veins exists most often in the legs and feet. Varicose veins occur in the legs and lower extremities because standing and walking increases the pressure in the veins in the lower half of your body. Is it only a cosmetic concern? For many men and women, varicose veins and spider veins (these are the smaller and more common variation of varicose veins) makes them feel less attractive. However, it’s important to note that for others, varicose veins cause aching pain and discomfort. This condition may lead to serious problems if not treated. Moreover, varicose veins may also serve as an indication that the individual is at a higher risk of other disorders of the circulatory system. As with many other health related issues, self-help measures work well for prevention; compression stockings and changing certain aspects in one’s lifestyle. The Endo Laser Vein System, or ELVeS, uses laser fibers to treat varicose veins in an outpatient procedure that is only minimally invasive. The doctor first uses ultrasound to identify the damaged veins. Then, he or she numbs the area with lidocaine for the patient’s comfort, before starting an IV through which to introduce the laser into the vein. Under ultrasound guidance, the doctor inserts a tiny fiber into the vein and positions the laser light to close off the damaged portion of the vein. During the procedure, the doctor can actually monitor the path of the laser energy on the screen. The energy from the laser is absorbed by both the water in the blood and cells of the walls of the vein, causing them to heat and collapse. The laser is so precise that it does not damage the surrounding tissue. What Are the Advantages of ELVeS over Other Procedures? ELVeS takes less than an hour and can be done without general anesthesia or hospitalization. ELVeS minimizes the possibility of perforations of the vein during the procedure. According to most patients, the worst pain involved is the injection of lidocaine which feels something like a bee sting. Other procedures such as vein surgery leave scarring and are much more expensive, particularly those requiring hospitalization. Although sclerotherapy can chemically achieve the same results as ELVeS, it is not always recommended for larger varicose veins. Unlike some other procedures, ELVeS leaves the skin smooth with no changes in pigmentation and results in less bruising initially. Who Is a Candidate for ELVeS? Most individuals with incompetent or leaky superficial veins of the leg are perfect candidates for ELVeS. This system is effective for problems with both the great saphenous vein and the small saphenous vein. Recovery after treatment with ELVeS is generally quick and almost pain-free. Following the procedure, the doctor will apply a compression garment and ask the patient to walk around the office for about twenty minutes before leaving. Patients may immediately return to normal activities other than strenuous exercise, but the compression stocking must be worn for about a week. Patients may periodically feel a pulling sensation in the area of the treatment, but this generally can be resolved with over-the-counter pain medications. The doctor may do a follow-up ultrasound to ensure that the vein closed completely. ELVeS has a success rate of around 98 percent. 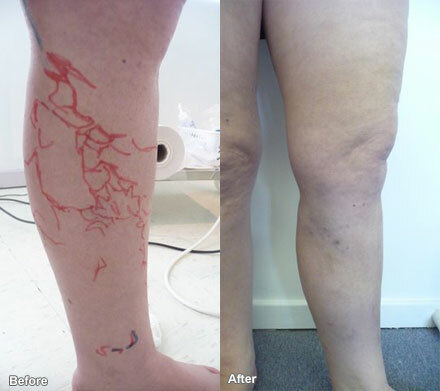 After treatment with ELVeS, patients should have almost instant relief from the pain of varicose veins. The ugly, bulging blue lumps will be gone, and once the IV site has healed, the skin should be consistent in texture and coloring with the surrounding tissue. Because most providers use state of the art cooling systems when treating with a laser, this treatment carries little risk. A very small number of people develop blood clots following treatment with ELVeS. The only other reported side effect is some numbness in the affected area. Though this usually disappears with time, some patients have reported permanent numbness in a small part of the treated region.